Home > Campaigns > Public Transit > City Approves LRT Rapid Transit Plan for Toronto! A 14 month campaign by TEA to bring rapid transit into the suburbs was successful when City Council voted 24-19 to build a Light Rail Transit (LRT) line on Sheppard Ave East at a Special Council Meeting held on March 21 and 22nd, 2012. The results of the special meeting are proof that our voices were heard. The vote ended a grueling special City Council meeting which spanned two days. It saw Council agree to a motion by Councillor Glenn De Baeremaeker to build the Sheppard East LRT line which will travel from Don Mills to Morningside Avenue. This is the fourth and final piece of the Rapid Transit Plan that will be built with $8.4 Billion from the Provincial Government and $333 Million from the Federal Government. 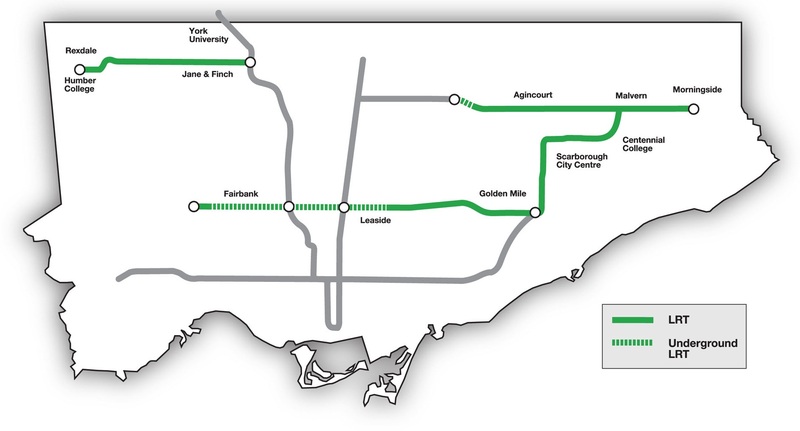 With this plan approved, Scarborough will now have 3 rapid transit lines to improve transit riders mobility. Transit riders on the crowded Finch Avenue West buses have a rapid Finch Ave LRT to look forward to. Torontonians across the City will now have a rapid Crosstown LRT line on Eglinton Avenue, underground where it needs to be, to improve travel from one end of the City to the other. The next step in this plan rests with the Province. Our Provincial leaders wanted a clear and complete plan from Council and with today’s victory the have it.